We are a leading OEM Manufacturer of White Diamond Beads, Natural Cuebs Types White Diamond Beads, Fancy Yellow Color Diamond Beads, Natural White Uncut Diamonds Beads and Untut Fancy Raw Rough Diamonds from Surat, India. 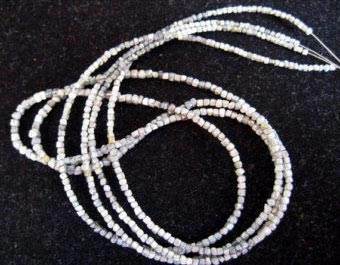 It's Diamond Is Verry Natural Cuebs Tiype White Diamonds Beads With Opaque & Sparkle Clarity. We Hve Available 0.25 Cts To 1.00 Cts. Per Pieces With Drilling As Suitability Size Of These Is 16' Inches Is Running Size Drilling Whols Size Of Bead Is 0.250mm To 2.00mm.. Other Details; Minimum Order Quantity; 100 Carats Supply Abibility ; 5000 Carats Per Month. This diamond is very sparkling&clarity .its beads size 16,20,&22 inchese.every diamond drilled whole size of 0.250 mm to 2.00 mm. supply abibility ; 5000 carats per month. This diamonds is very sparkling &clarity .its beads is very fancy diamond beads his diamond driled whole size 0.250mm to 2.00mm .this beads availbe to size 16,20&22 nichese. supply abibility ; 5000carats per month .